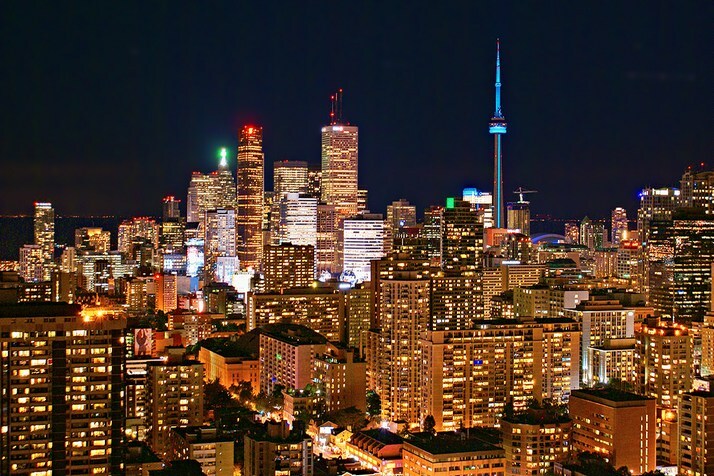 Toronto, Canada is known as one of the most livable and ethnically diverse cities in the world. It is a city that we have been studying for decades because of its constant evolution. Toronto is a contemporary example of very effective urbanism. It is a city where the architecture of individual buildings is mostly irrelevant. It’s the urbanism created by the disposition of structures and open spaces that counts. 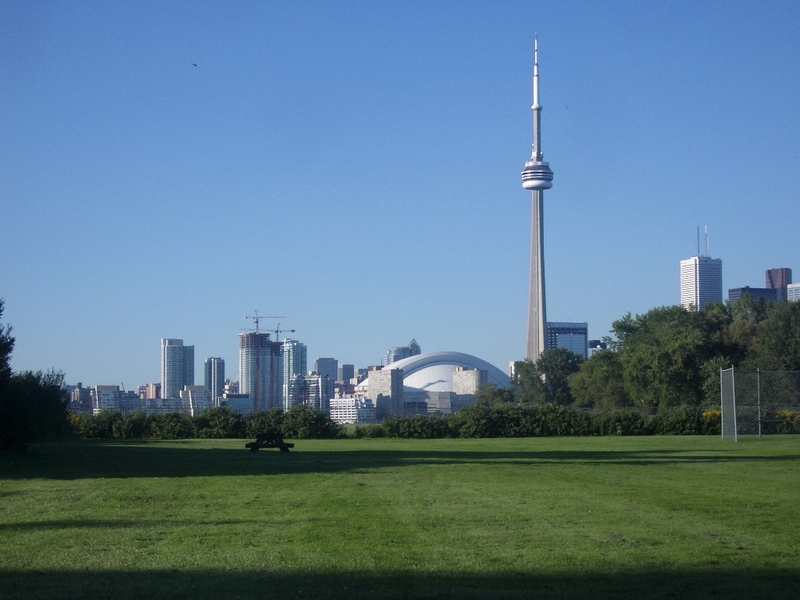 Toronto is a city that is growing in population, due to pro- immigration policies, as well as physically, due to market demands for development. Toronto is a city still in transition. It has gone from its “Hog Town” origins of the 1890s- based on the fact that it had become the major supplier of premium bacon to the British Empire-to the distinction as one of the most cosmopolitan cities in the world today. Within its metropolitan borders can be seen many of the emerging trends in urban demographics and physical form. 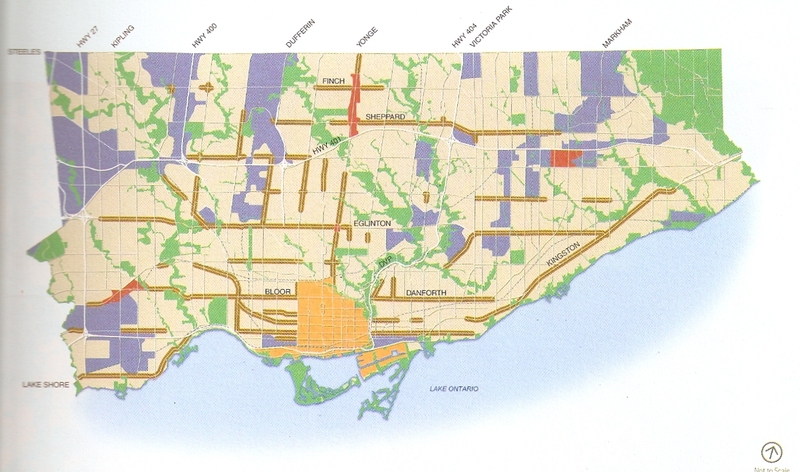 Toronto is home to almost every imaginable ethnic group dispersed throughout its greater urban/suburban region. The physical form of the city is an interesting study in urban/nature juxtaposition. One of its most striking and least known physical characteristics is the network of ravines that run through the city. Large swaths of green space, typically about seventy feet in width, snake their way through and beneath the city creating a subversive element within the rigid urban framework of neighborhoods and districts. Whereas many traditional urban cores have had to manufacture major natural areas within their dense city cores for “relief” (Central Park in New York, the Commons in Boston, Prospect Park, Brooklyn, etc.,..) 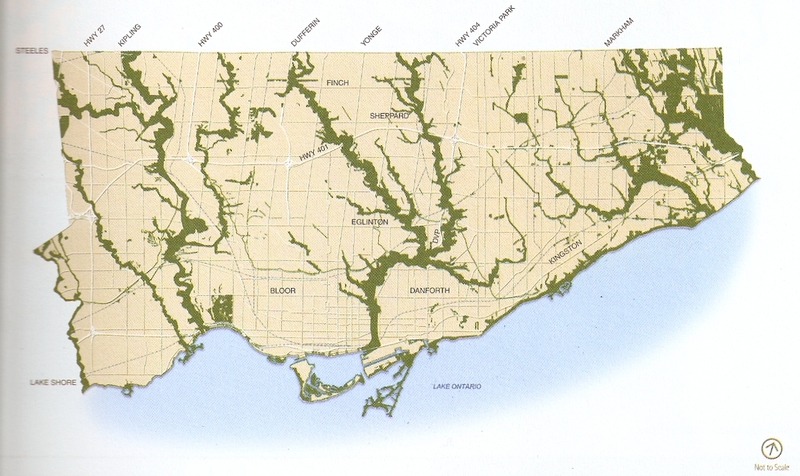 Toronto has unique natural areas built into its existing fabric. The ravines flow from the edges of lake Ontario through the downtown core and into the inner neighborhoods of the city and beyond. These elements remain essentially hidden due to the fact there are no specifically designated points of entry. They remain a mystery even to long-time residents of the city. They are home to bike trails, soccer fields, and, in a nod to bad planning decisions, partially a freeway. Neighborhoods abut these “green snakes”. Major thoroughfares overlook them. They are a vital part of a unique urban condition. Anomalies in the urban fabric help to alleviate the rigidity of the city grid. The ravines add a unique natural element to the urban landscape. Toronto is specifically reinvigorating its waterfront with a variety of projects that are combining landscape, urbanism, density, and use. Archive DS had the privilege of being one of the international team members for the conceptual redevelopment of the “Portlands”, a former shipping port on the city’s east end. This experience allowed for a rethinking of the kinds of urban space and districts that were appropriate for an emerging world city. The Portlands- An example of re-imagining the post industrial waterfront. 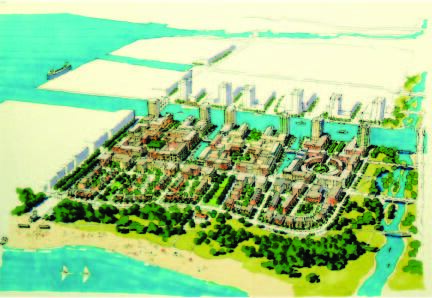 Toronto urban designers are also engaged in re-envisioning their commercial thoroughfares. The “avenues” are being transformed from suburban oriented strip corridors to higher density, walkable districts. Zoning and codes are being revised to accept this new reality. An outgrowth of the emphasis on higher densities is the revaluation of the form and the role of the tall building in the city. The placement, street condition, and location within the city of these new towers are oriented towards enhancing the character of the city. 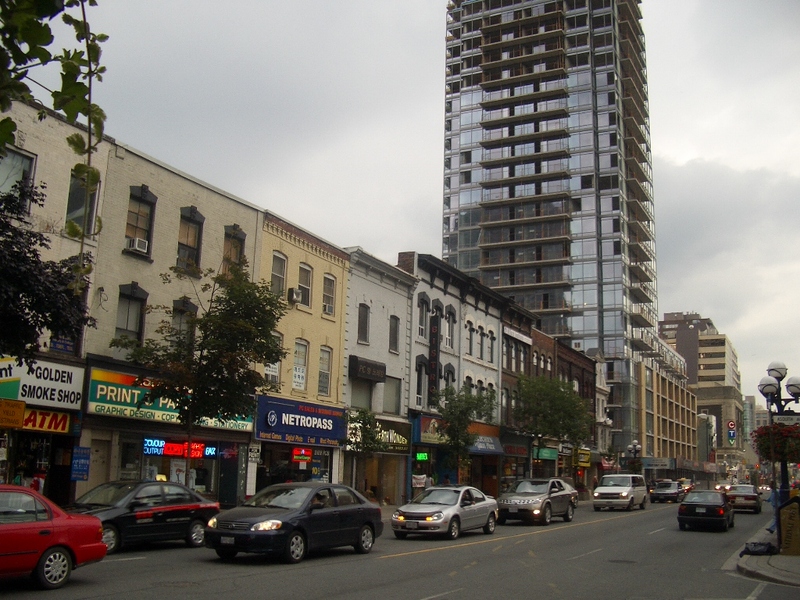 The commercial avenues are a main focus of a redefined Toronto. The challenge of fitting the tall building into a lower scaled streetfront. A few posts ago we introduced the concept of the City of Opportunity. The City of Opportunity must exploit its unique physical attributes to instill a sense of value and uniqueness to the shared experience of its citizens. Future posts will present and analyze specific projects within the city and how they provide a new way of thinking about urbanism. Dealing with nature as a desirable amenity within the city will be paramount to counteract the rapid suburbanization of North America in the latter half of the 20th century. To ease the now inbred misunderstanding of the virtue of density among North American citizens, natural elements must coexist with, not dominate, the urban realm. Toronto presents a vision for how to achieve this without resorting to the familiar Central Park model.